Dr. Chris Shepard is 36 years old, newly married, and well on his way to a perfect life. Or so he believes. But that future is forever cast into doubt the day Special Agent Alexandra Morse walks into his office and drops a bombshell: Dr. Shepard's beautiful new wife is plotting his murder. 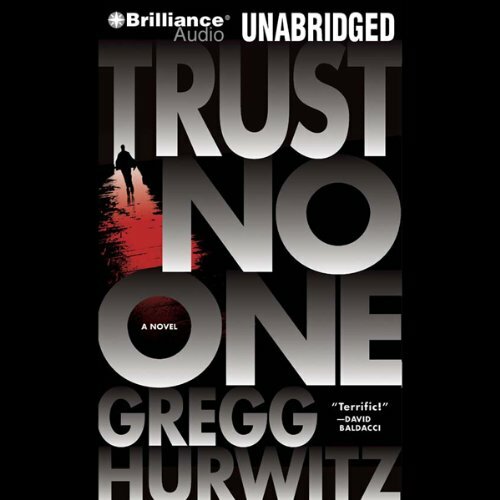 Acclaimed for years by both critics and his peers as one of the finest thriller writers today, Gregg Hurwitz has lived up to all the accolades and expectations with Trust No One, an electrifying and compelling novel that will be remembered for years to come. 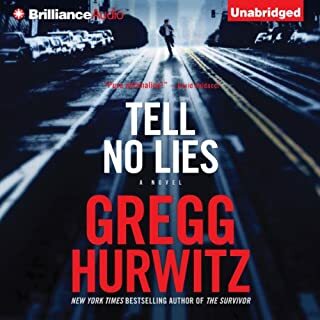 ©2009 Gregg Hurwitz (P)2009 Brilliance Audio, Inc.
What made the experience of listening to Trust No One the most enjoyable? It was a fun ride. The story kept me hooked and got me through a few work outs and house chores. I finished it too quickly, because it was hard to put down in the middle- Hurwitz does a good job of keeping the suspense amped up. What other book might you compare Trust No One to and why? I read his most recent book, You're Next" first - it was the first of his books I've read and absolutely loved it, so I decided to give this one a try. I have to say it wasn't as good as You're Next, but it was still fun to listen to. This author is good at creating complex characters and, even if the situations seem unbelievable, the characters reactions in them are believable and that makes it easy to enter the dream of the novel. What about Patrick G. Lawlor’s performance did you like? At first his voice kind of annoyed me, but once I got used to it, it seemed right for the character. I actually appreciated that he didn't try to do women and child voices, but just changed his voice a little for the female characters. i wouldn't say it's the kind of book that moves me. It was more the kind of book I read for some escapism. Not as good as You're Next, but i'd certainly read more by this author when i'm looking for that certain kind of thriller. This one grabs you in the very first sentence. It just get's right to it. The characters were believable - excitement was throughout the book, no dull moments. Patrick Lawlor did a good job. 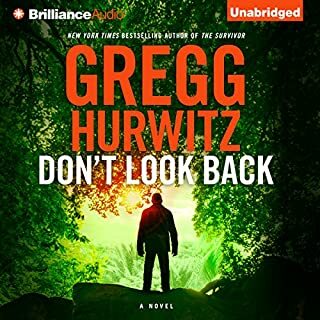 I'll be listening to more from Gregg Hurwitz. Really enjoyed this book and I felt the narrator did an excellent job. Have listened to many books by this narrator and have no qualms about listening to any book he reads. As for the plot, action all the way. Am currently going through this author's back catalogue so he must have left a very favourable impression with me. Listen to it you will not be disappointed. Struggled through this one. The story was decent however, the narrator just didn't work for me. There wasn't much of a "performance" just average reading aloud. Maybe I'm just spoiled by a lot of very good performances. Loved this book. 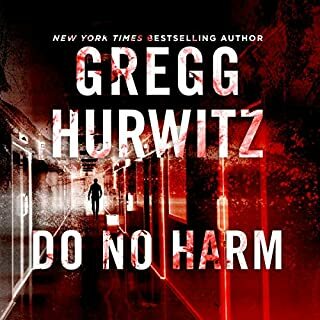 Can't wait to lisen.to another book by Greg Hurwittz. best I've heard in a long time. Poor Nick Horrigan, he’s sort of the Job of the thriller world. From the first moments, the guy’s in puzzling troubles all supported by flash-backs of even worst torments. 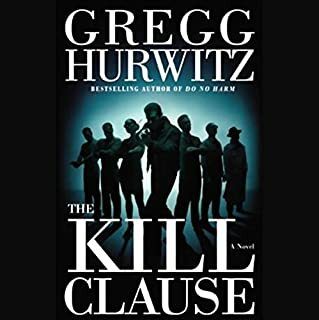 And yet even though things keep getting worse for the guy, the puzzle that Gregg Hurwitz forces Nick through had me listening on to the end. And unlike a lot of reviewers, I thought that Patrick Lawlor’s interpretation of the cast was a sticky flypaper for my imagination. He kept me listenng to Horrigan’s cool what-dunnit/who-dunwhat tale. 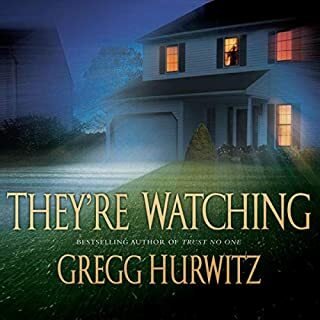 I love Gregg Hurwitz storytelling ability. He truly gives new meaning to the word "twist." The pacing was great, but I must admit I much prefer other narrators over Lawlor. Still, the story is good and worth the listen. Can't wait for more from Hurwitz. Would you consider the audio edition of Trust No One to be better than the print version? Mr. Hurwitz is now my new favorite author. This is the 3rd of his books that I am blasting through and I can't get enough. If you like one, you will like the others. There is one that stands just a tad over the others, but Dean Koontz could take one of Mr. Hurwitz's classes! I love that he makes you identify with the characters. He understands the human element so very well, and you find yourself thinking that you'd do the same thing as the characters do. Bad guys are not just bad guys, and the good guys are just normal, decent people. I hope he branches out a bit from the same type of mystery thriller because he has that nailed and I'd love to see his take on other venue's. Like most fiction, it's just entertainment, however you really get sucked in hard and fast. He is technically right on with most everything, including creating situations that are not so far fetched. It's mostly conspiracy theory stuff, but not in the normal or usual way you would think. Any of these books would make great action movies. Mr. Hurwitz has a great ability to twist and turn on a dime, while moving at 100 MPH. If it were a book, you could not put it down. You have to know what happens next. The ending(s) are all really well done, not unrealistic. Expect to be well entertained and I seriously doubt you will be quite happy with this or his other books. The narrator on this one starts out a bit annoying and it took away from the first 1/3 of the book, but then he seemed to get much better and was fine. The other narrator, Scott Brick, does well with these books, though I could not hardly stand him in the Preston/Child books. Those two write some pretty great books too, and I've been though ten of them. 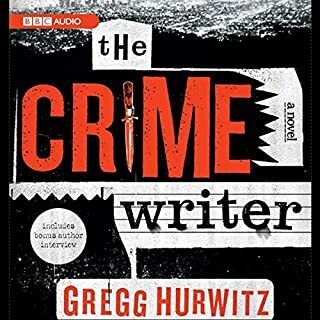 Always a wild ride with Gregg Hurwitz. I finished this in two days while I worked on some projects. I couldn't stop listening. Great story.